A fieldbus combines in a system field devices such as gauges for the purpose of communicating with a control device. If multiple communication participants send their messages over the same line, then it is necessary to determine who (ID) says what (reading, command) and when (Initiative). For this purpose there are standardized protocols. Since 1999, field buses are standardized worldwide in the IEC 61158 standard ("Digital data communication for measurement and control - Fieldbus for use in industrial control systems"). Today, many different field bus systems (eg Modbus, Profibus, etc.) are established on the market with different properties. 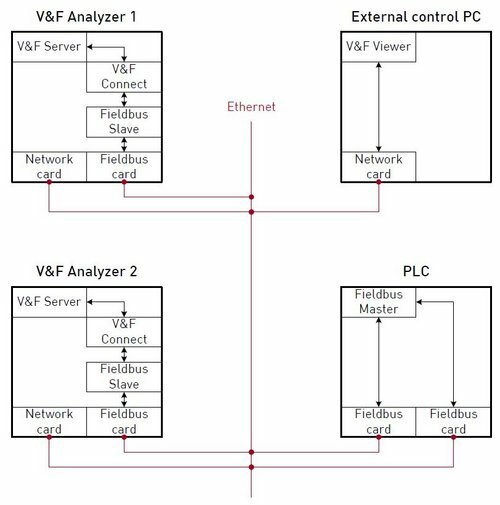 The following figure shows the connection of the fieldbus interface via Ethernet.